Add a dash of firepower and sleek design to the Robot Spirits line and you're going to get the powerful close-range fighter, Strike Noir! Just like its name suggests, Strike Noir is finished in perfectly fierce black coloring. 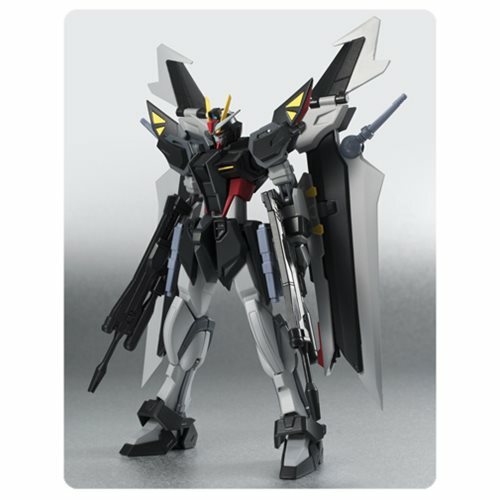 Strike Noir also comes with impressive wings that are fully adjustable for action packing posing possibilities. Set additionally comes with 3 interchangeable hands, 2 anchor launchers, 2 beam rifle shorties, 2 high energy beam rifles, and 2 beam katana! Ages 15 and up.